It started with Steven saying that he wanted to go over finances on Thursday nights. Just so we could stay on top of spending, saving, upcoming expenses, etc.. I agreed that would be a good thing to do! Of course, the lister in me started thinking about all the other things we could go over together once a week. Oh my goodness, Babe, we should have a meeting! Like a weekly meeting!!! I was a genius. Until Pinterest told me this was already a thing. I found out it’s called the Weekly Meeting. There’s really nothing new, people. But! The idea is still brilliant and we jumped right on board. So you both can stay on the same page. I haven’t been married long but even when we were just dating, I knew that it’s easy to make assumptions or get derailed when you’re not taking care to stay on the same page with your partner. In marriage, there are so many variables that depend on both people knowing the game plan in order to avoid confusion and misunderstanding. Checking in weekly with your spouse is essential to staying in sync with your sweetheart. Meeting weekly gives us a chance to review each other’s responsibilities, and expectations. Steven knows what I can and will take care of and I know the same of him. We know when adjustments are needed or when we need to ask for help. We don’t have to guess or assume if something is going to get done because we already discussed it. …and it’s easier when you know what to expect. You gain mental, emotional, and even physical space when you know what to expect in certain situations. Especially the mundane, every day ones. Steven doesn’t have to worry when he knows what tasks I’m taking care of. I don’t have to wonder when he keeps me apprised of what’s going on at work. And when life throws curve balls, meeting time is already scheduled to discuss and come up with solutions to problems. This can help reduce stress and makes life much easier! I’m a huge fan of good conversation in all relationships. That’s something that Steven and I have shared since day one. We’ve always been able to talk through things even when they’re difficult and uncomfortable. Sitting down and checking in weekly is just one of many really great ways to keep communication lines open. It’s a meeting of the minds. I get so stuck in my head and am filled with opinions and ideas that I can’t wait to share with my husband. More often than not, however, he’ll come up with an angle, opinion, or idea that I hadn’t considered but prove awesome and really helpful. Your spouse’s perspective and contribution should be part of the reason you married him/her. The weekly meeting is like a meeting of the minds. You get to come together and create game plans, strategize, review, celebrate victories and go back to the drawing board. This is teamwork at it’s best. 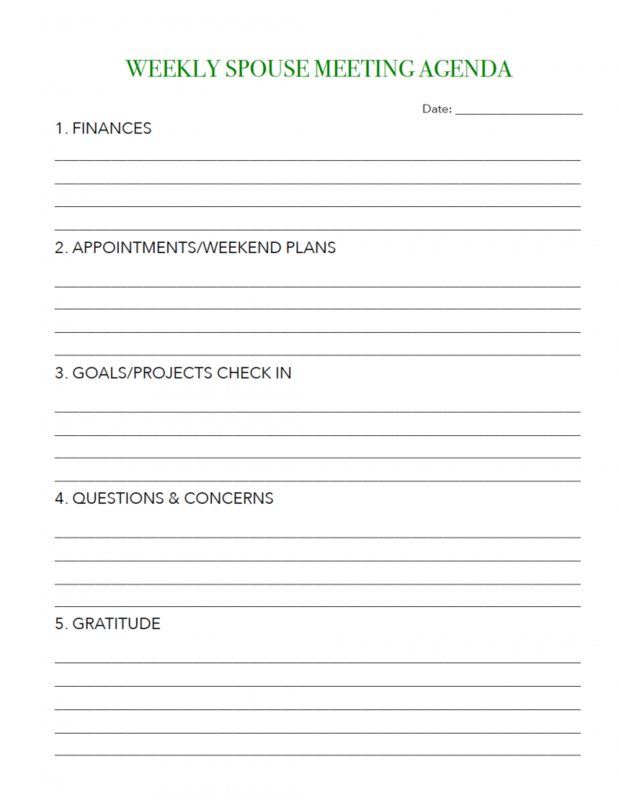 There are several great posts out there with ideas and printables but here is my humble list and what my hubby and I go over during our meeting. We are really into our finances right now. We want to create good habits from the front end before we slip into bad habits later on. We’re on month two of our monthly budget and are trying a couple new things while juggling a few unexpected expenses. Keeping on top of where our money is coming from and going to is EXTREMELY important so that we don’t make careless & unnecessary mistakes. We review any bills that will be due in the next week, any extra or special purchases we may need to make, and any changes we may need to make. This is pretty self-explanatory. What time is your appointment? What job are you doing on Thursday? Who’s got a birthday party? What day did you say you’d be late for dinner? What responsibilities do we have at church? Syncing schedules is important especially during busy seasons so you can keep track of who, what, when, where, why, and how. Less confusion and double-booking. More asking if the other person needs help or evaluating when there might be too much going on. These things do, of course, change but it prevents either of us from asking “what’s happening?” too often. Remember when you had that idea for that project you really wanted to do four months ago? Or what about your goals at the beginning of the year? This is a chance to review all the stuff we both want to accomplish collectively and separately. It can be a house project, a new habit or a weekend trip. We can ask for help, figure out what supplies are needed or research what we need to do. Do we need to save money for this activity? Should we set a deadline? What happens if it doesn’t get done? Can it wait until next week/month/year? How can I help you make this happen? These are great questions to get you to the next step in the process. We are big believers in being honest about things now and not letting things become unnecessarily bigger problems later. This is the time for asking questions and presenting the stuff that may be bothering you. And since it’s an item on the agenda, it should be a safe space. No judgement, no accusations. If something is brought up that will take awhile, you may have to table it for a more appropriate time when you have the space and time to handle it better. Let this be a time of openness and honesty. This way you’re on the same page about issues and can work through them together. End on a high note! What are you grateful to God for? What are you grateful to your spouse for. Taking time to show true appreciation is showing love. And who doesn’t want to feel the love? There are other things you could cover like meal planning, date nights and things pertaining to your children but this has worked really well for our season of marriage. Like I mentioned before, there are all kinds of printables on Pinterest but I needed something that better fit our needs so I made my own agenda. I keep several copies in my Home Management Binder ready to use at meeting time. 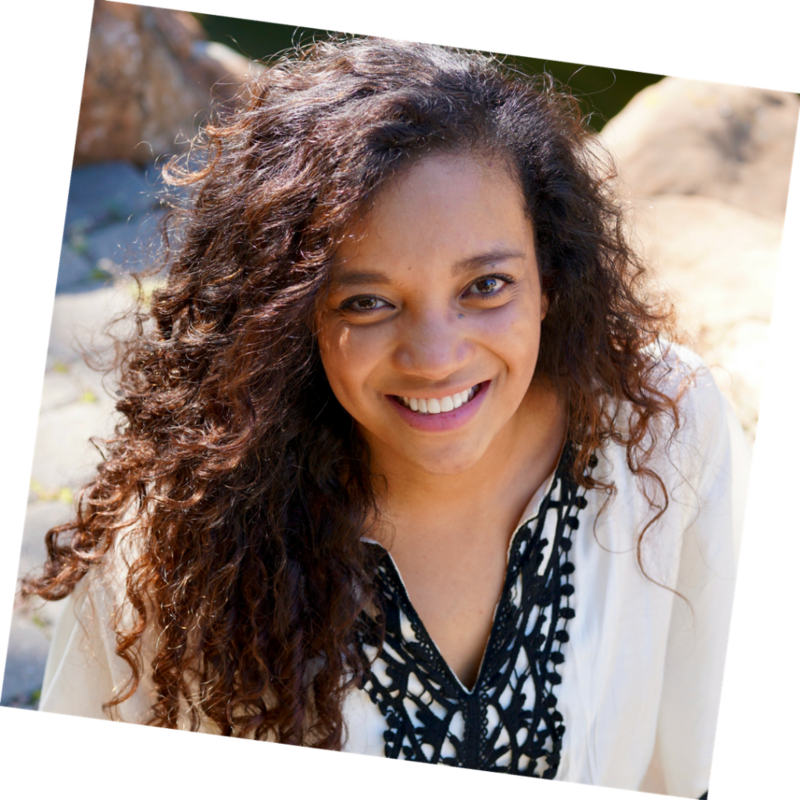 You can check out and download my Weekly Spouse Meeting Agenda right here and use it if it fits your meeting needs! Our weekly meeting is scheduled for Wednesday nights after dinner. That could change in the future but it works well for us now. Pick a day when you can carve out at least 30-45 minutes of uninterrupted time. Both my husband and I know that Wednesdays are now off limits and any evening appointments have to be scheduled on other days of the week. This is really easy for us cause we don’t have kiddos and I realize this is easier said than done when you’ve got little ones. Maybe you can make it a special time for them too when they get to watch a video or play games or something. It may take a several tries but make it something that they look forward to and a time they understand is important for Mommy and Daddy. Some families even do family meetings. I’m not qualified to write that post but check out Pinterest for ideas on conducting weekly family meetings. Pour a couple glasses of something you both love.We don’t drink but I love non-alcoholic bubbly. This is a meeting to get important stuff done but you can also unwind together too. Play some soothing instrumental music in the background. Clear the table of dinner dishes and any other clutter. Set the tone for good, comfortable conversation. This is husband and wife team business—enjoy it!! This is also not the time to answer phone calls. I should say don’t answer text messages either but we’re not strict on that and it’s never hindered our conversation. However, if one of you is habitually plastered to your phone, then by all means, leave it in the next room and focus! You don’t have to take detailed minutes but at least one of you should be jotting down the main points. Keep them in a folder for future reference, you’ll be glad you did! You might also come up with to do lists you have to take care of during the week–make sure you’re writing those things down. The last thing you want is to come to next week’s meeting and say you forgot what you were supposed to get done in the past 7 days. You’ll also need to bring out your calendars, laptops, or whatever you use to keep track of events, appointments, etc..
I’ve said it a couple times already but remember, you are a team and this meeting is about you two staying on track together. Be considerate, listen when it’s the other person’s turn to speak, don’t come with the desire to get your way. Be ready to be a team player not the coach. If you disagree on something, take time to talk it out or table it for another time. Don’t cast blame or say “I told you so.” It’s okay if you don’t solve every problem that comes up during that meeting. You may have to work through it a few times before you figure it out. This is a time to listen and share, not point fingers, belabor one another’s faults, or get your own way. Play fair and be nice! 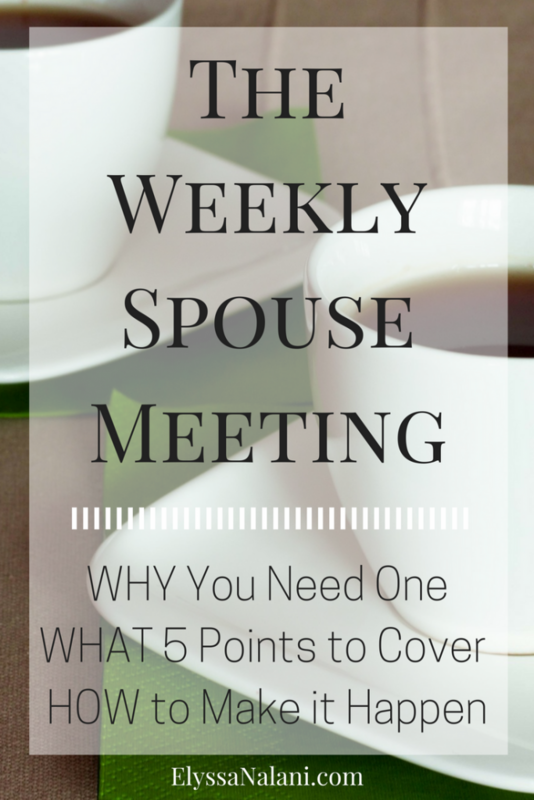 What do you think of weekly meetings with your spouse? Is it something you already do? What do you go over? Is it something you think you and your husband need? I HIGHLY recommend it if you’re not already doing it!